Dogwood trees are trees in the Genus: Cornus. This Genus consists of 30-60 mostly woody plants some of which grow into small trees. The Dogwood tree is an extremely common ornamental plant, dogwood trees offer beautiful flowers and unique fruits. 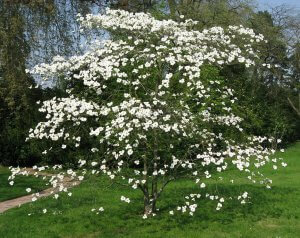 Dogwood trees do not get very tall and are ideal for landscape plantings where small trees are desired. Some are native to the U.S. and some are not, such as the very popular Kousa Dogwood which is native to Asia. Dogwoods all have berries but not all are edible. Dogwood fruit comes in many shapes, sizes and colors. 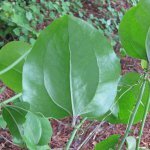 This article will discuss a few of the most common dogwood tree species and how to identify them by flowers or fruits and weather the fruits of that species are edible. Flowering Dogwood(Cornus florida) is one of the two most common ornamental species of dogwood tree, the other is Kousa Dogwood. 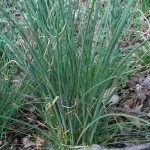 This species is native to the eastern United States, It grows well in woodlands as well as landscapes. 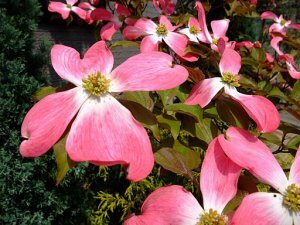 Flowering dogwoods prefer part shade and are perfectly adjusted to the acidic soil of the northeast. You can buy flowering dogwood saplings HERE. These dogwood berries are not edible. Some reports say they are poisonous. 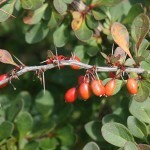 The berries are very astringent and bitter. 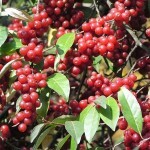 The red berries grow in clusters and mature into the fall. All Dogwood trees have similar shaped leaves. these are simple leaves with an ovate shape and visible leave veins. Ovate leaf shape is one of the most common leaf shapes so dogwood leaves are not easily identified by their leaves. Flowering Dogwood can be identified by their fruit clusters. These are red fruit clusters with elongated fruits. as mentioned above the fruit is not edible. Flowering Dogwood(Cornus florida) has very showy flowers in early spring. 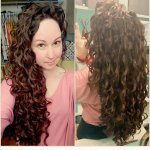 This species is cultivated very frequently and different varieties have been developed. Dogwood flower – Or is it? Technically the showy part of the dogwood flower is not a flower petal but a modified leaf called a bract. The flowers of Cornus florida are usually white but pink flowered varieties have been developed. Both pink and white flowered dogwood are very common. Kousa dogwood(Cornus kousa) is another very popular ornamental dogwood. This species is native to Asia, there are a number of varieties with slightly different flower and fruit characteristics. Kousa dogwood are planted because of their small size and relatively good pest resistance. 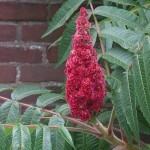 They get flowers in the spring and fruits in late summer and early fall. You can buy a sapling HERE if you want to grow kousa dogwood yourself. 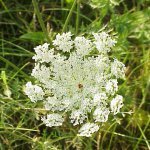 The fruits of this species are edible and one of tastiest and prolific wild edibles that can be found in the landscape. Although not truly a “wild” edible because kousa dogwood does not naturalize frequently in most areas. Part of the trick to harvesting kousa dogwood berries is choosing berries at the right stage. 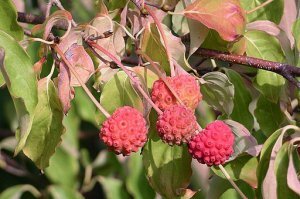 Read THIS article on kousa dogwood if you’re interested in more information on how to know when kousa dogwood berries are ready to eat. Kousa Dogwood can be identified by 2 primary factors. The bark and the fruits. 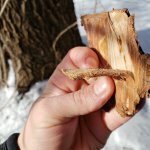 As kousa dogwood gets older the lower bark peels and creates a unique pattern similar to sycamore tree bark. The kousa dogwood berries are unique in size and shape. They are red berries formed into an approx, 1″ diameter fruit, this is technically an aggregate fruit but looks like a single large berry. The outer skin on the berry somewhat resembles lychee fruit. 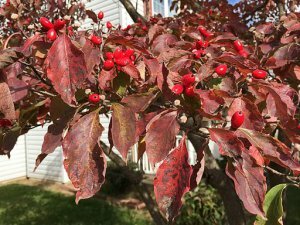 Cornelian cherry dogwood(Cornus mas) is another dogwood tree that is commonly sold as a landscape tree. This tree is not used nearly as often as the other species mentioned above, but it still has some interesting potential in the landscape. 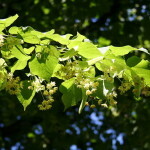 This tree is native to Eurasia but grows very well in the eastern U.S. One of the most fascinating features of this plant is it’s early flowering period. This plant flowers very early, sometimes before forsythia, it also has small yellow flowers not unlike forsythia. 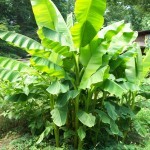 This is one of my favorite Trees, you can buy saplings on amazon to grow them on your own property. The fruits of this species are edible. They are a single dark red smooth berry when ripe in summer. There is one large seed in the middle of each berry but you still get a significant amount from each fruit . They have a good taste but are very sour. I happen love sour fruits so they are one of my favorites. 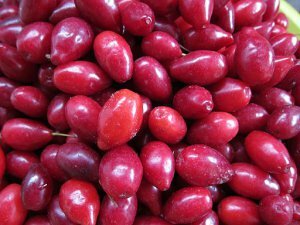 Cornelian cherry dogwood trees frequently get covered in berries so it is possible to use them in pies and jams. Even though the leaves and bark are very similar, distinguishing this tree from flowering dogwood is easy. This tree has a completely different flower and fruit schedule then the flowering dogwood. Cornelian cherry dogwood flowers and fruits much earlier. So at any point throughout the year except for winter you should be able to see flowers or fruits or expect to see them depending on which tree your looking at. Since the berries and leaves on this tree are not distinctive enough compared to other plants in the landscape it’s recommended that if you believe you are looking at a cornelian cherry dogwood then you should compare that plant directly to an identification guide.